March is Washington Wine Month and Woodinville Wine Country has special offers and events all month leading up to the state’s premier wine event, Taste Washington, March 28-31. Support local growers, producers, and retailers by trying and buying Washington wines. Stop by Airfield this month to taste their newly released 2017 Chardonnay and 2017 Bombshell Red. Buy a 4-pack of any Airfield wines and get a different gift with purchase each week. room or browse their website to save on your favorite BCC wines. 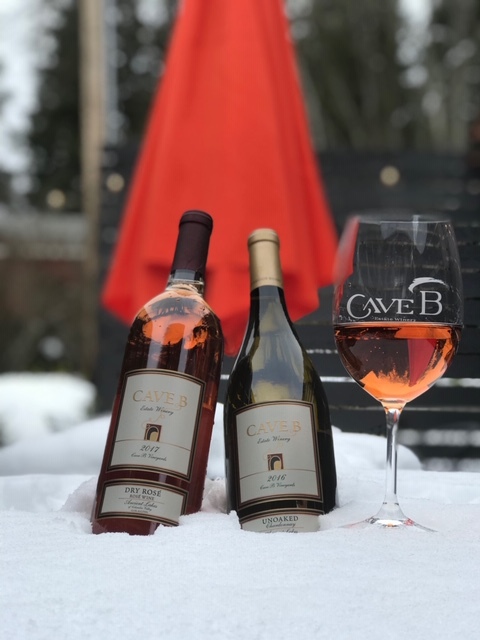 Cave B Estate Winery is offering special pricing on a few of their most popular wines. Swing by to taste and take advantage of savings on their 2016 Unoaked Chardonnay, 2017 Dry Rose’, 2015 Merlot. (2016 D2 and 2016 Four Flags only). You can visit DeLille Cellars online, in Woodinville at the Carriage House Tasting Room, or in Kirkland at Maison DeLille Wine Lounge. Join Lauren Ashton Cellars for a very special release for #WAWineMonth, and the newest member of the Lauren Ashton Cellars family — Ashton Troy Wines. Lobo Hills is celebrating Taste #WAWineMonth with a special offer on their 100% Red Mountain Cabernet Sauvignon and two glasses for $50 — a $10, savings! To celebrate Washington Wine Month, winemaker, Dave Stephenson, will be in the Woodinville tasting room all afternoon pouring barrel samples of his favorite wines from the 2017 vintage. Taste through some future releases and ask Dave all the questions you have about growing grapes and making wine! To celebrate Washington Wine Month, Pomum Cellars will only be pouring their sister label Idilico wines at Pomum’s tasting room every weekend during March. These are exclusively Washington wines made from Spanish vines. They will pour Albarino, Garnacha, Monastrell, Tempranillo and Tempranillo Reserva. The Idilico wines are typically only available to club members for tasting once a year, but many club members have requested that they be available for tasting more often and they are happy to oblige. 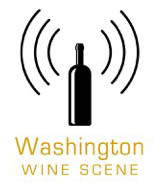 During Washington Wine Month Idilico Wines will be available for tasting for everyone. This is a must try experience! Want to see the Purple staff’s favorite wines? Check out their staff picks chalkboard and take home the featured wines at 50% off (normally only 40% off) throughout the month of March. Celebrate Taste #WAWineMonth with Tinte Cellars. Tastings are only $5 on Wednesdays all March long! The post Taste Washington Wine Month: Deals and Events in Woodinville Wine Country appeared first on Woodinville Wine Country. Is it really Valentine’s Day without wine? Woodinville Wine Country has special offers and events all month long whether you’re celebrating Valentine’s Day, Galentine’s Day or just a special occasion with family and friends. We hope to see you in wine country soon! Bring your special someone and enjoy 2 for 1 tastings and 25% off bottles of our highly rated Cabernet Franc on Saturday, 2/16. Just in time for Valentine’s Day, enjoy a romantic afternoon with Wellington Chocolate. This local Woodinville chocolatier will be serving up samples of their fine chocolates and toffee to enjoy with our European-inspired blended wines. To make the day extra special, winemaker Brian Carter will be on hand pouring a vertical tasting of Opulento (2013, 2014, & 2015) to round out your pairing with these exquisite chocolates. Specials that day include discounts on the Opulento three-pack vertical and discounts on Opulento & Chocolate combinations, packaged ready for Valentine’s Day. Enjoy special pricing on the ‘Cave Couple’ duo. The Cavewoman White is a delicious white blend and the Caveman is our red blend. Also try the 2018 Dry Rose’ and 2016 unoaked Chardonnay. Both popular and tasting amazing right now! On February 9th and 10th, the Chateau is hosting ‘Speak to Me in Chocolate,’ a seated tasting in the theater where you will learn about wine and chocolate, how to pair the two, and listen as they speak to you in chocolate. Come Indulge! On Saturday February 16th they are also hosting a Valentine’s Day chef’s dinner from 7pm – 10pm featuring dishes that are sure to warm your heart and spice up your night. Throughout the month of February you will receive 15% off all Winery Experiences (excluding Enoteca, Col Solare Bottega, and Single Vineyard tasting), perfect for couples or groups. The BLEND experience is perfect for any celebration and you even have the chance to leave with a bottle of your own creation to document the special occasion. DeLille Cellars is offering their ‘Just D2 of Us’ and ‘Opposites Attract’ gift sets for Valentine’s Day at special prices. Just D2 of Us includes the 25th vintage of D2, two DeLille Cellars logo glasses, and D2-infused chocolates in a gift box while Opposites Attract features the Chaleur Blanc (white Bordeaux-style blend) and 25th vintage of D2 (red Bordeaux-style blend) in a gift box. They will also be bringing back a limited amount of Rosé for February. Stop by the J. Bookwalter Tasting Studio in Woodinville on Saturday, February 9th for a Valentine’s Day Stella & Dot Pop Up! They will be offering specials and promos all day to help you find the perfect bottle of wine for your Valentine’s Day Dinner. This event is free to attend, don’t miss out on this shopping and sipping afternoon! 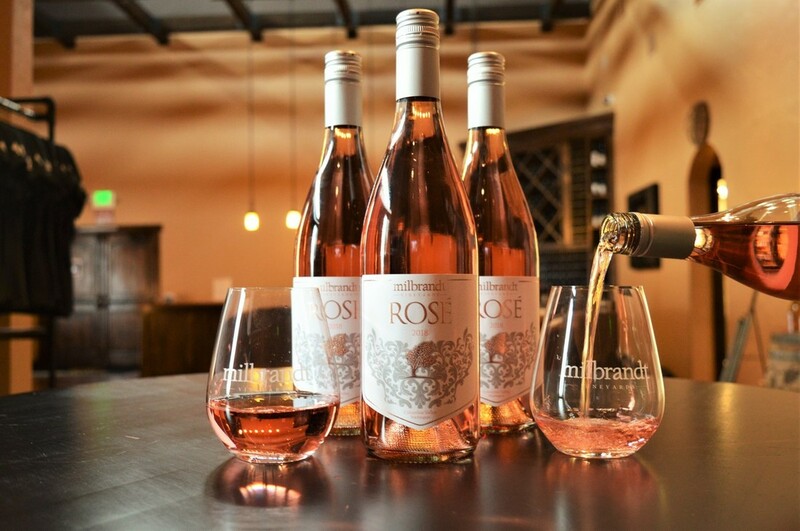 Beginning February 14th through the 17th, Milbrandt Vineyards will be pouring their new release of the 2018 Rosé and all wine tastings will include a complimentary sample. Wine Club Members can visit the Members Only Rosé Lounge on Sat., February 16th 1pm – 5pm for snacks and rosé-themed surprises! The VERA series is named after winemaker Greg Matiko’s daughter, who’s birthday is also in 2017. Vera, meaning faithful and true, makes this Skylite Cellars trio the ideal Valentine offering for your sweetheart! Plus, on Feb 16th RSVP to their Perfect Pairings event — Lovers of Wine & Lovers of Cheese! Between 12-7pm you will enjoy perfectly matched Skylite wines with individual gourmet cheese plates! $20; RSVPs required; Contact Sharon@skylitecellars.com. The Do Not Disturb Package is perfect for a quick romantic overnight getaway for Valentine’s Day or anytime! Rates start at $419/night. Reserve your spot on Open Table at The Barking Frog for their special Valentine’s Day Pri Fixe Menu. Chef Bobby and team are serving up a sumptuous menu available Feb. 14-17 $80.00 per person, plus tax and gratuity/wine pairings $45 course. Limited seating available. The post The Best of Valentine’s Day: Deals and Events in Woodinville Wine Country appeared first on Woodinville Wine Country. Dirty Bucket Brewing is located in Woodinville, Washington right next to Locust Cider. Steve Acord, the owner of Dirty Bucket Brewing, recently announced that he is merging his company with the cidery next door. The result, the brewery formerly known as Dirty Bucket will soon be known as Locust Brewing. Re-branding like this can be rough, especially when your current brand has been around for seven years, like Dirty Bucket Brewing. That’s a point not wasted on the folks at Dirty Bucket, but Steve says that he looks forward to the new partnership and the opportunities for creativity that it will provide. The post Dirty Bucket Brewing, Merging with Neighbor and Changing Name appeared first on Woodinville Wine Country. Although the state grows many varieties, such as Cabernet Sauvignon and Riesling, they all share distinct qualities that make them uniquely Washington. Washington grows grape varieties ranging from Aglianico to Zinfandel. Still, a connective thread runs through the state’s wines. In general, these wines bring together a New World ripeness of flavor (think of the opulence of fruit from wine regions like California and Australia) with an Old World type of acid and tannin structure (similar to the austerity of the wines from places like France and Italy). This creates an expression that straddles the two styles, but remains distinct to Washington. What makes the state’s wines taste the way they do? It’s a combination of three factors: geography, geology and climate. The post The Diversity of Washington Wine appeared first on Woodinville Wine Country. As in Oregon, Washington experienced a warm growing season, but one balanced by moderate weather as harvest approached. “It was a hot start to the vintage and for a while we thought it would be the hottest on record,” said Juan Muñoz-Oca, head winemaker at Ste. Michelle Wine Estates. “In June we had very nice weather, and then it got hot all of July and most of August,” said Cayuse winemaker Christophe Baron. The post 2018 Wine Harvest Report: Oregon and Washington Vintners Are Pleased Despite a Hot Summer appeared first on Woodinville Wine Country.